The Chevrolet Bolt is off to a respectable start in terms of US sales, but will it become America’s top-selling green car? In “12 Factors That Will Limit Chevy Bolt Sales In The US (Part 1),” I offered up the first 6 factors that will unfortunately limit the Bolt’s sales, preventing it from coming close to those achieved by the Toyota Prius at its height of popularity. In this article, I close out my case with 6 more factors. 7. It’s a Chevrolet. During the 1920s, GM CEO Alfred Sloan was attributed with the aphorism “a car for every purse and purpose,” which described GM’s integrated, multi-brand marketing strategy. Each of the GM brand’s products was to be focused on one segment, with Chevrolet at the low end of the market and Cadillac at the high end. While GM’s portfolio of auto brands has been slimmed down over the last two decades, Chevrolet is still the entry-level brand and Cadillac the luxury division. No matter how great of a car, let alone EV, the Bolt is, being branded as a Chevrolet limits its attractiveness to image-conscious and early buyers on the West Coast and East Coast of the US. 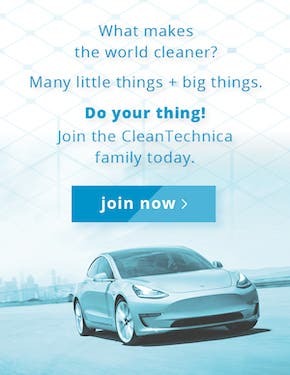 That is a novel goal, but isn’t a smart strategy when we are still so early in the adoption of EVs and only a small percentage of car buyers are ready for an EV. In 3-5 years, GM’s strategy would make much more sense. Launching the Bolt under the Buick brand. The Bolt could be sold as a Buick in America as I’m guessing it will be marketed that way in China as the sister Volt model is as a Buick Velite 5. The Buick brand, while certainly not a high-end brand, might be a better fit for the higher cost of the Bolt and more image-conscious buyers. Using the Buick nameplate for the Bolt would also have lessened the confusion between it and the Chevrolet Volt. Relaunch the Saturn brand. I’m probably clearly pushing the envelope on this one, and the restructuring agreement with the US government might prohibit relaunching the brand, but the Saturn brand and its “A different kind of company” tagline could have been the ideal brand platform to launch an entirely new kind of electric car. 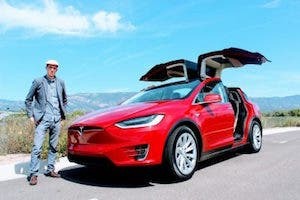 Think about the brand opportunities and approach to marketing, sales through subscriptions, and dealer reps highly knowledge about electric cars. The “Saturn Bolt” could still be sold and serviced through Chevrolet dealers, but underneath a distinct brand. Create a Bolt EV “sub-brand.” Similar to the Prius model brand, position the Bolt as a new line of electric cars that is an extension of the Chevrolet brand. They would be sold and serviced as Chevrolets but positioned as a special model line of electric-only cars. While more subtle than being part of an actual separate brand, it would at least give the Bolt a little bit more cachet and separation. 8. Confusion between the Volt and the Bolt. In conversations with friends, I discovered that many were confused by the difference between a plug-in hybrid and pure electric car and often identified incorrectly which type of EV the Volt and Bolt were. To understand this better, I conducted a small survey of 67 US consumers on social media, which while not statistically valid, nonetheless confirmed for me the confusion I was seeing in conversations. Fixes. 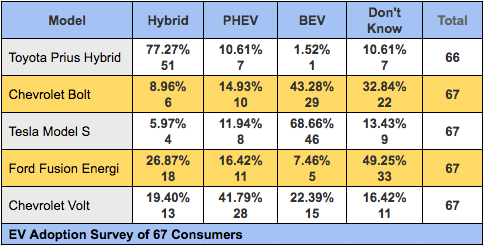 The PHEV versus BEV confusion is an industry-wide problem that GM can’t solve, but the company does need to incorporate increased education and awareness of the different types of EVs in its marketing and advertising programs. And it is obviously too late to attach the Bolt to a different GM brand, but GM definitely needs to create clear differentiation between the Volt and Bolt by, for example, positioning the Volt as the option for drivers without convenient access to charging and who regularly need (or want) 250+ miles of range. 5 years from now, when EVs are more mainstream, the Bolt’s design and looks won’t matter as much, but in the current stage of the market, it doesn’t stand out. And that’s a problem. 10. It’s too short. As a small crossover, the 164 inch-long Bolt is actually several inches shorter than hatchbacks like the LEAF (175″), Prius (179″), and Ford Focus (173″) as well as many of the popular small SUVs/crossovers. By comparison, GM’s own Buick Envision, a small SUV/crossover, measures out at 183.7 inches and is priced similarly to the Bolt at $34,065 to $42,715. While there is a market for short hatchbacks and crossovers, the Bolt’s length does not fit with its price, nor provide enough room to take those weekend trips to the mountains and take advantage of its 238-mile range. Fix: GM can’t change the length of course, so this is where a lower price point and lower-range battery option for the Bolt would help it competitively. Positioning it more as a commuter and city car would then help, but it would then run up against lower-cost/shorter-range EVs. 11. It isn’t likely to wow Californians. Californian’s purchase 50% of EVs in the US, so to do well, the Bolt needs to find its niche among these left-coast buyers. GM needs to position the Bolt as greener, cooler, hipper, and much better than the fading Prius. 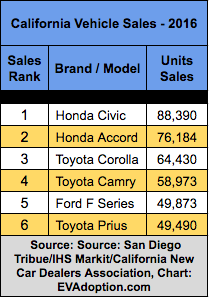 Californians like Hondas and Toyotas and are huge buyers of Prius models. The popular Ford F Series pickup truck, the #1 selling vehicle in the US, only outsold the Prius in California in 2016 by fewer than 400 units. 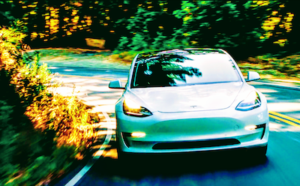 The Bolt will sell fairly well in California, but its lack of distinction, lack of clear positioning, and lack of fast charging networks will severely limit its sales in this critical state. Fixes: See all of the previous points. Low gas prices, declining auto sales. These factors are obviously out of GM’s control, but they might impact Bolt sales more than many other EV models because of its premium price relative to its category. 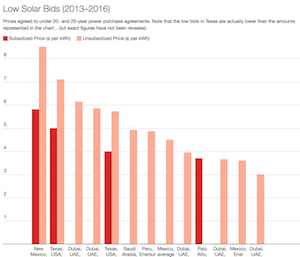 Higher-income Tesla buyers, for example, will rationalize their purchase even with low gas prices and are more likely to be less affected by the economy. Buyers of a $40,000 Chevrolet, however, might instead opt for a used LEAF or lower-priced Prius. 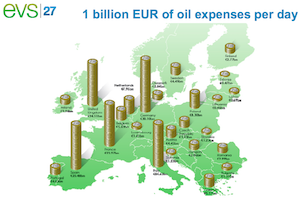 Loss of federal tax incentives. The US federal tax credit for buyers of GM PHEVs and BEVs is likely to start phasing out in Q4 of 2018. As such, this is likely a non-factor for about two years, but in the future could affect Bolt sales against similarly priced EVs from brands that still have the tax credit available. On the flip, sales could see an uptick as the tax credit phaseout approaches. Dealer motivation. With 2 visits to a Northern California Chevrolet dealership and test drives of the Bolt, I was actually impressed with how knowledgeable the sales reps were about EVs. But even so, on the first visit, the Bolt I test drove only had 12 miles of charge, so acceleration was limited (one of the reasons I came back for a second test drive). 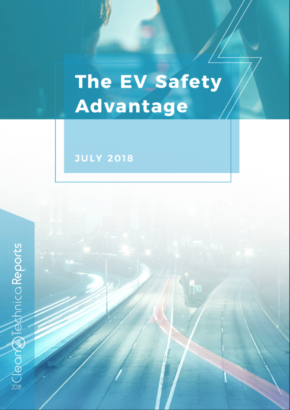 But based on the Sierra Club study of the electric vehicle buying process from 2016, Chevrolet dealers, especially those in California, scored well — so I don’t expect Chevrolet dealers to hold back on promoting the Bolt, except in the middle of the US. The Bolt is an excellent effort from GM. It’s the first truly serious 100% battery electric vehicle produced by one of the US Big 3 auto companies. But GM made several mistakes that will hold the Bolt back from becoming America’s favorite green car. Let me know where you think I got it right, where I’m completely off base, or what I may have even missed some issues.